I've been posting this all over the place, might as well post it here too. I am selling all of my Blue and Splash Rosecombs. There aren't that many, but they're all available. They are from a Blue Brassy Back bloodline, so they do tend to produce colors other than the expected Black/Blue/Splash combo. For someone wanting to work on Blues, I'd suggest immediately breeding them to an unrelated strain of Blacks (or Blues) as mine are VERY closely related... full or half-siblings. For someone wanting to put some Blue into another color and work on something like Blue Red, this is perfect. They are GORGEOUS birds. Seriously, they knock my socks off, and I'll be showing them until they sell. I LOVE the Blue color, but in an effort to streamline a little and keep the "chicken thing" under control, I'm focusing on BBRed, and only keeping colors that will be helpful in breeding BBReds. I don't need Blue. I want to see them go to a good home with someone who is interested in working with them. I am not in a rush to sell them. Just puttin' the word out. I will ship. I'm not NPIP certified. I can deliver to a few shows in CA. You can find more info on the Random Rosecombs sale page. 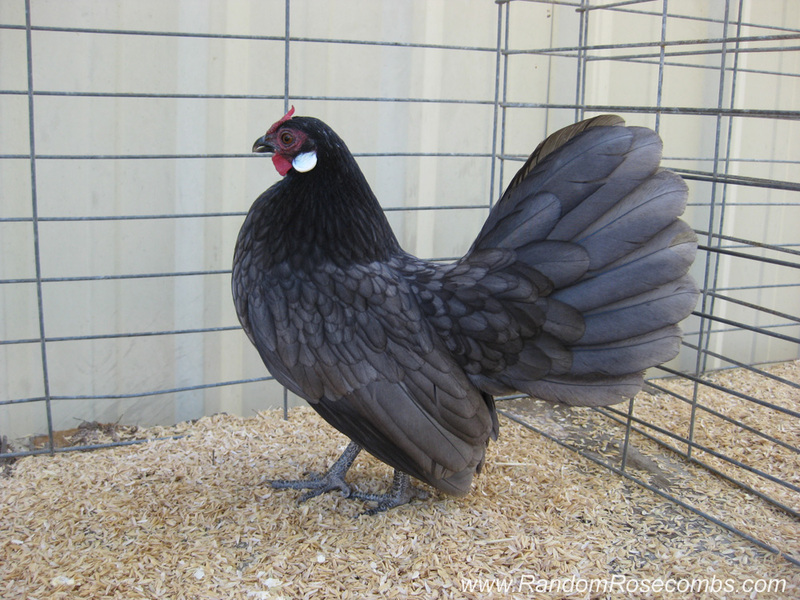 I adore this pullet. I would love to have her just to admire her every day. And maybe to breed some new colors of Dutch with. :D (Although your Rosecombs are so elegant and beautiful that I really want some of them too someday!) Alas, I am still not in a position yet to have chickens again!! Was this photo taken at Humbolt? -BMc. Thanks Sarah! I really like all these Blues too, I hope someone buys them because otherwise I'm just going to keep raising them... not what I need to be doing! B, no, it was taken by the barn. She's never been shown.